GNOME Boxes is a virtualization application that comes bundled with GNOME desktop environment. If all requirements are met, then this app can be installed on Unity desktop as well. It is used to create virtual machines on your current operating system. You can install other operating systems on these virtual machines and can use them as if they are stand alone computers. It is part of GNOME project and uses Qemu virtualization system on the backend to perform the actual virtualization tasks. It also acts are remote desktop client and remote file viewer application. It was introduced as a part of GNOME releases in 2011, it has been under active development and has received important updates and features over the passages of time. Right now, GNOME team is busy preparing the 3.17.4 release, so they have already launched the 3.17.4 version of GNOME boxes. You can download and test it on your current Linux operating system. Let’s see how we can install the latest version of this application. Please note that GNOME boxes is already included in the ubuntu package manager repositories, so you can run following simple command to install it on your ubuntu system, but n it will install little bit old version of the application. In order to install the latest 3.17.4 version, first of all download its source file from following URL. Once the download process is complete, launch your terminal and run following command to extract the downloaded file. Final step, run following command to complete the installation of this virtualization application. 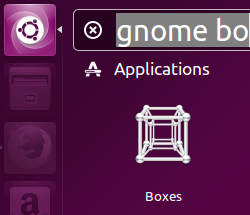 That’s it, launch it from Application >> GNOME boxes option. There you go, start creating and managing virtual machines from your ubuntu desktop.